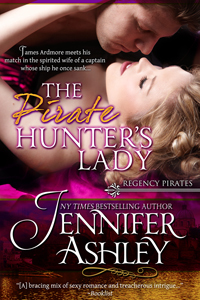 Pirate Hunter's Lady Release and much news! I’m pleased to announce the re-release of Book 2 of the Regency Pirate series, The Pirate Hunter’s Lady (original title, The Pirate Hunter). This is the story of James Ardmore, the pirate hunter introduced in April’s release, The Pirate Next Door, and the lady who steals his heart, Diana Worthing. The book will eventually be available on iTunes (Apple), Kobo, and Sony. It takes a bit of time for them to be processed there—keep checking back. I know The Pirate Next Door (Book 1) has made it to all of them. Why the new title for The Pirate Hunter’s Lady? The old edition is out of print—in the new edition, I’ve added chapters that detail Diana and James’s first meeting, plus I’ve re-written the epilogue to focus more on James and Diana. I went through the entire manuscript revising and polishing what was there. I had forgotten how intensely emotional James and Diana were for each other! Book 3, The Care and Feeding of Pirates will follow soon. It looks like I’ll be able to use the same cover art as for the print edition. I loved that cover! I had great news about the fourth Mackenzies book, The Duke’s Perfect Wife. It hit both the New York Times and USA Today bestsellers lists, the first of my historical romances to do so. I’m absolutely thrilled. Thank you so much! I have also learned that the first four Mackenzies books will be released as audio books. Madness of Lord Ian is already out, Lady Isabella and Many Sins of Lord Cameron will come out in June, and Duke’s Perfect Wife will be out in July. These will all be available from Audible, Amazon, iTunes, and wherever else you buy audio books. Speaking of Mackenzies, Many readers have asked me about Inspector Fellows, and if he will have his own story, and the answer is yes, he will. I’m talking over some things with my publisher, and I hope to have some announcements about that soon. The next Mackenzies books are already in the works (I’m currently writing Seduction of Elliot McBride, and Daniel’s book will be out after that). I am also hard at work at both Nightwalker (Stormwalker 4) and A Disappearance in Drury Lane (Capt. Lacey Regency Mysteries, 8). Now that my plate has cleared a little bit, I can finally focus on those books. The draft of Nightwalker is nearly done, I am happy to say. Also this year, in the Shifters series, Spike’s story—Hard Mated—will come out in mid-August. Mate Claimed, the next full-length Shifter book is out in October. I was hoping to do more short books in that series this year, but time has been crunched. I will do more, however. The weather is heating up where I live, intensely so. I’m turning up the air conditioner, pouring more iced tea, and typing away at more books.